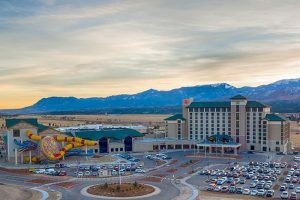 This coming 2020 Unschooling NOW is SO excited to be spending our fifth annual conference at none other than the Great Wolf Lodge, 9494 Federal Drive, Colorado Springs, CO 80921. Great Wold Lodge is honoring a guest room group rate for Sunday, February 23rd, 2019 through Thursday, February 27th, 2019, including up to three days prior to our event, and three days following our event, as rooms are available. 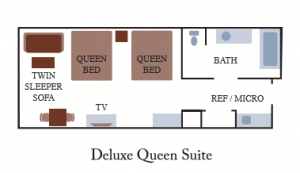 So you may come enjoy the amenities before or beyond the conference dates! Keep in mind, the “as available” on the extra nights will depend on weekend busy times and what is available. So if you do intend to come an extra night or two on either end of the gathering, please book your rooms early! They are holding our block and our discount for our event dates only. The extra nights on either end are “as available.” Book early if you intend to enjoy some extra time there! You only need to pay 1-nights stay upfront and can cancel up to 72 hours before your stay ($40 cancellation fee applies). 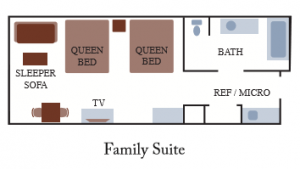 Family Suites – Sleep up to 6 people – $115 per night, 6 waterpark passes included. Our resort fee has been reduced from $34.99 to $9.99. If you run into any snags, please contact unschooling.now.co@gmail.com. Thank you!